A comprehensive guide to the OISC system of regulation and legal ethics aimed at OISC Level 1 advisers, with top tips on examination technique. This free and comprehensive guide to the OISC’s exams and regulations at Level 1 includes a walk through of how to prepare for the OISC exams, what to expect on the day of the exam as well as a detailed look at what work is permitted and prohibited at Level 1, how the categories for registration work, how the OISC Code of Conduct works in practice for immigration lawyers, what signposting, referral and outsourcing mean and how they work. We conclude with twenty pages of our top tips on preparing for the exams, what happens in the exams on the big day and on examination technique. 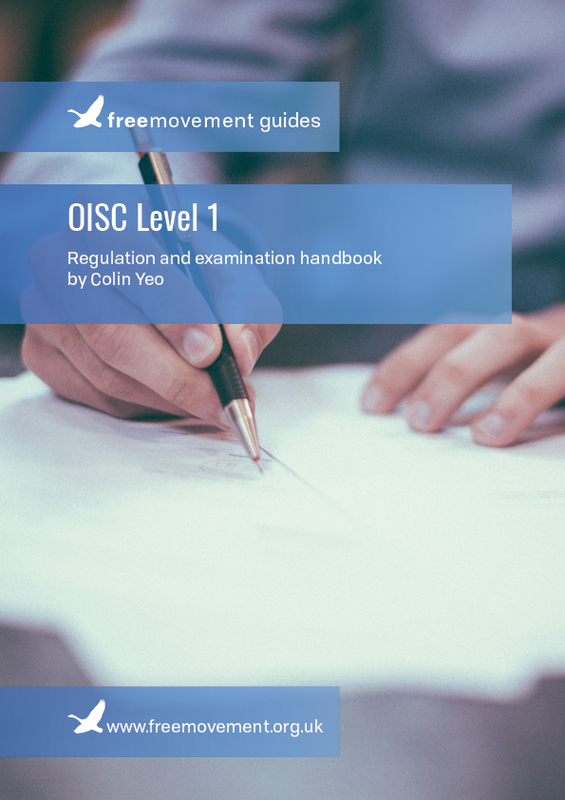 We use plain language and examples throughout the ebook to explain how the OISC scheme and exams work and provide links to key OISC resources like model documents and frequently asked questions. This is the ideal starting point if you plan to apply for registration at OISC Level 1. We also offer a 20% discount on the first year of full Free Movement membership for new OISC advisers signing up for our annual individual plan, bringing the cost down from £200 plus VAT to £160 plus VAT. This includes access to our three sample mock exam papers and our full OISC Level 1 training course on immigration, asylum, nationality, EU and business immigration law: everything you need to know to prepare for and pass the exams! This is very informative and magnanimous. It helps to bring qualitative information and guidance into the practice. Thank you. Comprehensive and easy to understand. Great stuff. The e-book is very useful as a guide to the students who wants to do OISC level 1. I am not a lawyer, nor an “immigration professional.” However, I found the book very clear, and the multiple choice tests a way to check my understanding of the parts of immigration edifice that interest me. Thanks for making it available. I loved this guide, it was so helpful and I discovered things that will now make a difference between passing & failing the exam. There isn’t too much help on the net regarding becoming regulated however this free guide has proved to be a valuable resource for me. Thank you so much for sharing this !